German manufacturer Metz has announced a new set of flash radio triggers. 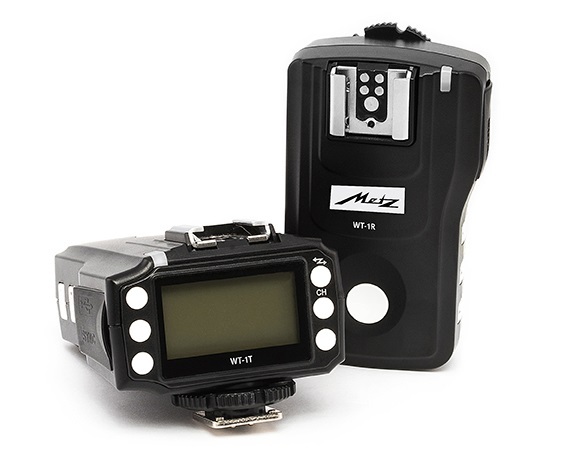 The Metz Wireless Trigger WT-1 Kit is available for Canon, Nikon and Sony cameras and offers TTL control, high-speed sync (HSS), manual power adjustment and grouping functionality. The WT-1 system debuted at Photokina this year, alongside the Mecablitz M400 compact flashgun. Using a set of WT-1 triggers you can control up to three groups of flashes, and remotely adjusting their operating modes, exposure compensation and other settings from the LCD interface of the Metz WT-1T transceiver on your camera. The WT-1T can act as a master (transmitter) or slave (receiver). The Metz WT-1R is a dedicated receiver unit, equipped with a coldshoe foot and tripod socket so you can mount it anywhere you would otherwise mount a camera or flash unit, such as on a bracket or tripod. According to Metz, the system will work over ranges up to 100 metres. It will also work with studio flashes (using a sync cord), and future-proofing is provided through firmware updates via USB port. The WT-1T transceiver and WT-1R receiver are each powered by two AA batteries. Unlike most other products from Metz, the WT-1 triggering system does not include “Made in Germany” in the feature list. This is because it is quite clearly a rebrand of the Pixel King Pro flash triggers, which are made in Shenzhen, China.